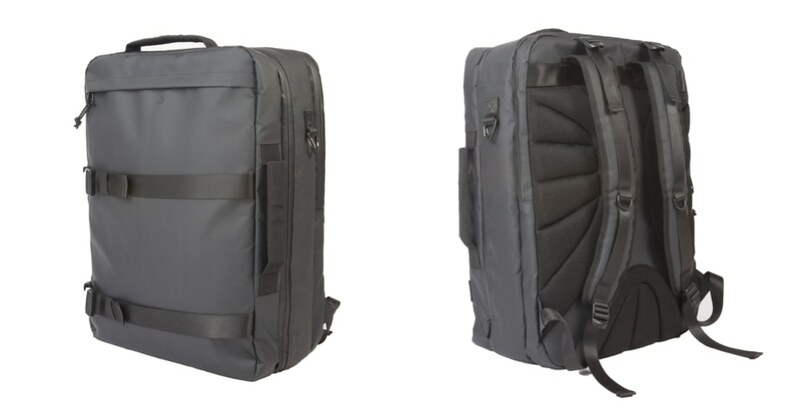 At the time of writing this Kickstarter backpack had raised over 200% of its initial goal of, a very modest, £4,000. It’s developed by Olivier and Yann — kitesurfers whose love of off beaten tracks led them to develop a simple, strong, unbranded, and water-resistant pack. The money raised on this campaign will allow them to bulk produce the Y backpack and fund development of a duffle and day backpack. Like many of the recent backpacks I have reviewed the Y opens like a suitcase with one side having the addition of a zippable mesh cover. Although I have yet to see the bag in the flesh its 40-litre capacity suggests it’s more than spacious enough for a few days away and with measurements of 54cm x 38cm x 22cm means it will fit most airline carry-on requirements. In addition to the two main compartments, there’s a slot on the back of the pack for a laptop (up to 17”) as well as other everyday items like notebooks and keys. Externally there’s a bottle holder, a zippered full-length pocket ideal for magazines and two compression straps allowing you to secure items to the pack externally. Unlike other packs, this is definitely a backpack and doesn’t have the option of hiding straps and converting into a messenger or briefcase but I like that. Often those additions add weight and if you have no intention of using these features then why bother. I’m also a big fan of unbranded luggage and this definitely ticks that box. Finally, it’s worth mentioning the introduction pledge is a mere £70. This looks like a great value pack and definitely worth considering if you are in the market for one today. The campaign is funded and closes on Monday, July 9, 2018.